My last Bible character biography discussed the righteous Noah. Today's subject stepped away from God's will, despite Godly influences around him. And each step away from God was a step closer to disaster - for him and his family. Who? Lot. You can read Lot's story in Genesis 11:27-14:16 and Genesis 19. He is also mentioned in Luke 17:28-29 and 2 Peter 2:6-8. Lot was Abram/Abraham's nephew - the son of his brother Haran, who died in Ur of the Chaldeans. Lot traveled with Abraham and Sarah when they left Ur and headed toward Canaan, and he stayed with them until they arrived in Bethel. Once there, the conflict began. 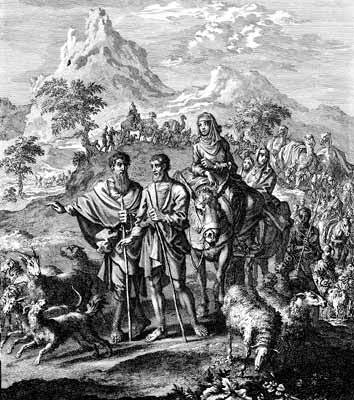 Abraham and Lot's herders quarreled, and the land could no longer support both of them. So Abraham allowed Lot first choice of where to settle. And here is where Lot took his first recorded step away from God. He decided to go east, to the Jordan plains. Abraham, however, stayed in Canaan, the land of promise. Here the progression begins. 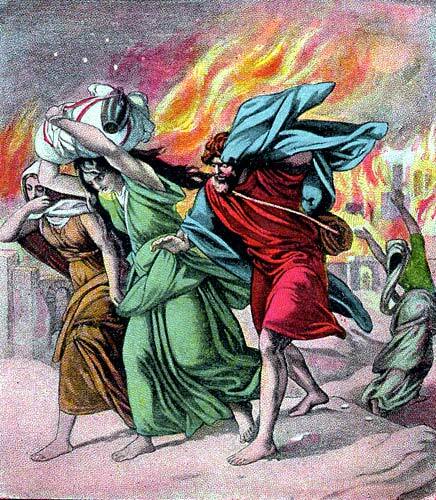 If you note in Genesis 13:12-13, the text indicates that he pitched his tents near Sodom - a people who were known to be "wicked and were sinning greatly against the Lord." But it doesn't stop here. 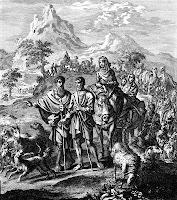 Just a chapter later, Abraham needs to come to his nephew's rescue when he and his possessions are captured by local kings. And Lot is no longer simply living near Sodom at this point. He is now living in it (Genesis 14:12). Not a step in the right direction. So Abraham rescues his nephew and they both return to their homes and Lot disappears from the story: until Genesis 19:1, when we find him standing at Sodom's city gates. This is the place where business is transacted; where judgements are made. Apparently, Abraham's nephew not only lives in this wicked place, but he is a leader of the city. And the city has not improved under his guidance. In fact, Sodom, along with its sister city Gomorrah, is about to be destroyed by God. If you want to see how bad it had gotten there, just take a peek at Genesis 19:4-9. And we know what happened to Sodom. I could go on and talk about his wife's longing to stay and the consequences to her (Genesis 19:26), Lot's daughters and their successful plan to obtain heirs (Genesis 19:30-38), or the legacy of enemies his children brought to his uncle's people. But I think you get the point. Every step away from God's will led to disaster. It's easy to get caught in Lot's mentality. He probably didn't think living near a city like Sodom would hurt. But he was drawn in. And you and I could be too. Every time you step away from God's will, you step toward disaster. Have you ever been on Lot's slippery slope? What is the best way to avoid the sad circumstances of Lot and his family? Thanks Jo, for this great reminder to not be tempted to take even one step toward sin. Sin always devours and destroys. Trust me, Rita - I needed the reminder as much as you did. Thanks for stopping by. Great piece, Joanne. God bless you for sharing. Thanks, Joseyphina, for stopping by. I'm glad I blessed you!